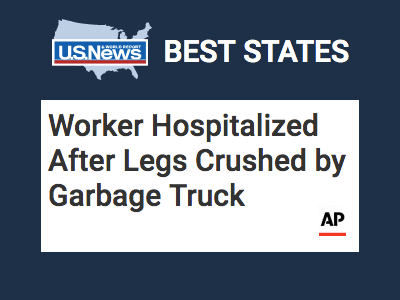 Sanitation San Worker Seriously Injured / Legs Crushed in W. Va.
A sanitation worker in West Virginia was hospitalized w/ serious injuries in truck accident. BLUEFIELD, W.Va. (AP) — A sanitation worker in West Virginia has been hospitalized after he slipped off the back of a reversing garbage truck and was partially crushed. Bluefield Police report that the man was crushed from his toes to his hips on Wednesday. He was hospitalized with broken bones and crush injuries.